Rachel Joy Scott was an ordinary girl in an ordinary world. She went to school, faced drama just like any other teen, and struggled with issues common to any girl her age. However, there was a certain element to her life that set her apart from many girls at her school– Her faith. Rachel was convinced that Jesus was the answer to any problem, and she lived her beliefs out at school, at home, and with her friends. 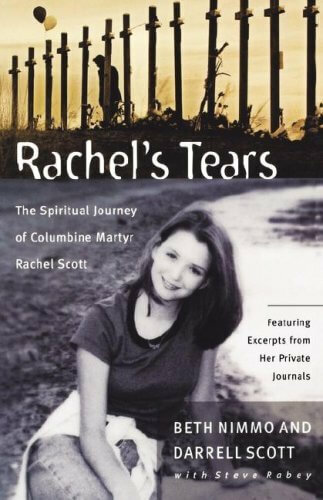 Rachel’s Tears documents her personal battles, accomplishments, and everyday walk with Jesus Christ leading up to the tragity that took her life. I can’t emphasize how STRONGLY I recommend this book, and I can honestly say in spite of the heartbreaking story of Rachel’s death, her life story is one the most inspiring ever written. I now can join thousands of others, who thank God that He used Rachel Joy Scott’s tragic death to tell the story of her remarkable life. I am reading this book right now and i wa just thinking of what had happened in connecticut at Sandy Hook. How those kids and Rachel are heros in all of the other childrens eyes! I am sorry for your loss, but greatful that such a religous girl was living on this planet.